Rangers survived the concession of a late Osijek equaliser to secure a Europa League third qualifying round tie with Maribor. However, Nikola Katic's close-range header had given the Scottish Premiership side the lead. That, added to Alfredo Morelos' winner in Croatia, saw Rangers through. With Maribor having beaten Georgian outfit Chikhura Sachkhere 2-0 on the night after a goalless first leg, the Glasgow side face a rematch with the Slovenians who knocked them out at the play-off stage in 2011. It could have been plain sailing for Rangers had Lassana Coulibaly snapped up an early chance from a corner, but the on-loan Angers midfielder blasted over from four yards. Daniel Candeias had been preferred to Jamie Murphy on Rangers' right, and the Portuguese and Coulibaly were both denied by a strong outstretched hand from goalkeeper Marko Malenica. Osijek's Robert Mudrazija had claimed in the build-up that his side were "better, stronger, more skilful and better organised" and it was the midfielder who threatened first for the visitors as the game started to swing from end to end. His low drive bounced off the body of the advancing McGregor and the goalkeeper then had to stretch every sinew of his body to touch away Ezekiel Henty's curler and was quickly up on his feet to push away Peter Bockaj's powerful shot at the near post. An edgy Rangers had been their own worst enemies with some loose possession in midfield, but they were rejuvenated after the break. Goalkeeper Malenica had looked impressive in the first half, but he made a nervous start to the second and had already flapped at one cross before he contributed to Rangers' breakthrough. 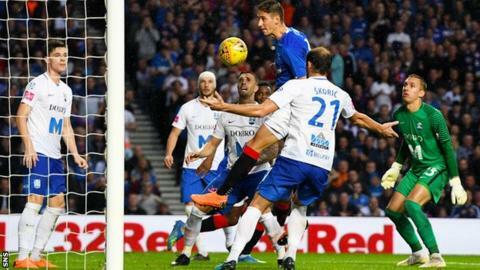 He failed to clear James Tavernier's curling free-kick and, when Morelos headed back into the six-yard box, Malenica could only look on as Katic provided the finish. With Osijek pressing for an equaliser, Rangers threatened on the break, with Morelos sending their best chance into the side netting. It looked like Gerrard's side were cruising to victory until Osijek captain Barisic beat McGregor with a rasping drive from the edge of the penalty box.